OSF Preprints accelerates scholarly review, publishing and discovery. The launch of OSF Preprints branded services continues COS’s ongoing commitment to open and transparent research practices. The new preprints service is built on our flagship platform, OSF, which helps researchers design and manage their project workflow, data storage, DOI management, and collaboration. OSF Preprints uses SHARE to aggregate search results from a variety of other preprint providers such as arXiv, bioRxiv, PeerJ, CogPrints and others. Over a million preprints are indexed and can be searched by author or keywords, or filtered by subject, preprint server, and most recent contributions. Preprint contributors are encouraged to provide supplemental data and materials, if available. If the preprint is associated with an existing OSF project, that project is linked for further exploration. OSF Preprints makes sharing research as easy as uploading a file. Post your work, solicit feedback, and tag categories for others to find, comment on, and engage with you. 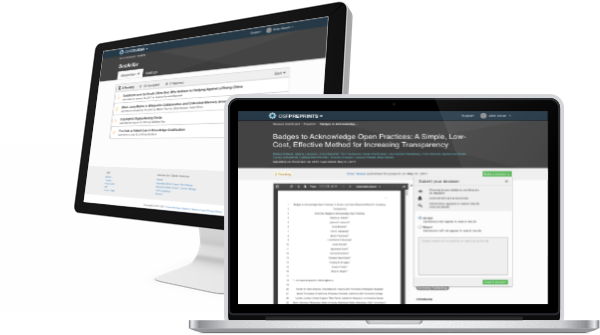 OSF Preprints integrates OSF project infrastructure, allowing researchers to include supplemental data, materials, code or other information alongside their preprint. These files can be stored on OSF Storage or through connected services like Github, Dropbox, AmazonS3, Box, GoogleDrive, OwnCloud and others. All branded preprint services are automatically indexed in OSF Preprints aggregate search, which harvests data from many preprint providers. Using a keyword search or subject filter, visitors can search across all of these providers from one site. You build the community. We've built the infrastructure. COS provides branded preprint services to communities interested in building a preprint service for a specific discipline, research topic, geography or other commonality. The branded preprint services are built on OSF Preprints infrastructure, a shared toolset for file upload, sharing, persistence, and discovery. OSF Preprints and branded preprint services are integrated with SHARE for search and discovery. SHARE allows users to search across all preprint platforms, including those hosted by other groups such as arXiv, bioRxiv, and PeerJ. You can focus your efforts on generating research, not on managing research infrastructure. The service can be configured to match each organization's brand, editorial focus, licensing requirements, and taxonomy. Once configured, a new service can be up and indexing new preprints in a matter of days. 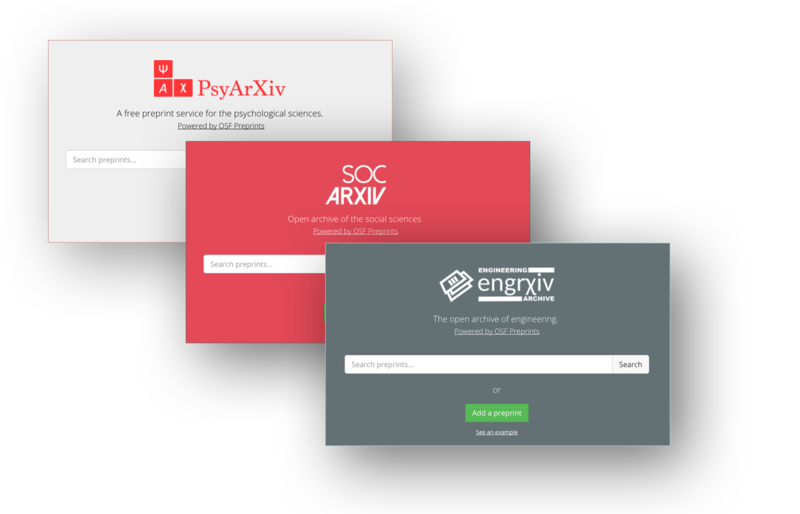 We have already launched five major new branded services--PsyArXiv, AgriXiv, SocArXiv, engrXiv and LawArXiv--and are adding more all the time. These partnerships provide free, open access, open source archives for psychology, social, and engineering science research and are in response to the growing need for faster, open sharing of research on open platforms. All OSF Preprints and their branded affiliates are indexed in Google Scholar for maximum discoverability. Preprint submissions to your service can be moderated for quality and compliance, either pre- or post-publication, to ensure the integrity of the content. Admins can enable one or more moderators to check for copyright, accuracy and fitness using your editorial policies. Authors and moderators both receive notifications on the status of any submission. Our advisory group includes leaders in preprints and scholarly communication.